This is ReachMD, and you’re listening to Closing the Gaps in NSCLC, sponsored by Lilly. On this episode, titled Disease Progression Factors, we will hear from Dr. Howard Jack West from the Swedish Cancer Institute in Seattle, Washington. There are a lot of factors that are associated with progression of disease, and many of those we really don’t understand that well. Some are well-known, like PD-L1, as a marker associated with a better chance of responding, often doing well for an extended period of time on immunotherapy. Otherwise, issues like patient performance status is associated with doing better with treatments. There are also just other factors that are associated with a more aggressive biology. Some of these, like p53 or KRAS, are established markers that we don’t necessarily have a targeted therapy to pursue but are associated with a more aggressive phenotype of cancer. STK11 is another one, and there are more and more. We just have clinically observed for decades that some patients have a pattern of a more indolent process, natural history, often associated with a more differentiated—so when you see a well-differentiated or a moderately-differentiated cancer, this is associated with a better outcome for the patients, really regardless of what you do; it just tends to have a slower tempo. On the other hand, patients who have tumor histology that is poorly differentiated often associates with a more aggressive natural history and worse biology that leads to earlier, or is associated with, earlier progression. Other issues like the standard uptake value, the degree of hypermetabolism on a PET scan, is also associated with a more aggressive cancer. So, these are some of the factors that we look at. And then we also have hints like the clinical course of the patient. If often takes 2, 3, 4 weeks from the initial time a patient presents to a doctor to the time you’re evaluating them to start treatment, and in that time you may learn that the patient has rapidly escalating pain or is losing a lot of weight, or in the time between their initial x-ray or CAT scan in the emergency room and the PET CT that you do to complete their staging, 3, 3-1/2 weeks later, you might see that the tumor has grown significantly in size, and that, obviously, designates or suggests that this is a cancer that is at high risk to progress early and that we need to be very mindful of that possibility. The preceding program was sponsored by Lilly. Content for this series is produced and controlled by ReachMD. This series is intended for healthcare professionals only. To revisit any part of this discussion and to access other episodes in this series, visit ReachMD.com/NSCLC. Thank you for listening to ReachMD. Be Part of the Knowledge. 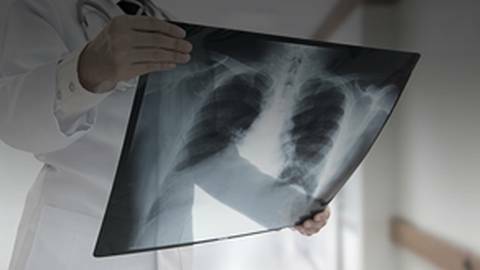 Successful identification of these underlying factors offers us insights into disease development in our NSCLC patients. With many factors yet to be discovered, Dr. Howard Jack West targets the clinical characteristics and molecular markers associated with disease progression in non-small cell lung cancer (NSCLC) patients. As he presents patterns observed for decades, Dr. West reveals other often underrecognized clues that drive disease progression. Closing the Gaps in NSCLC is sponsored by Lilly. Content for this non-certified educational series is produced and controlled by ReachMD. This series is intended for health care professionals only.